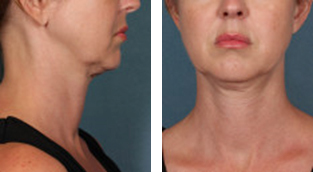 “Double chin” or submental fullness is that bit of extra fat under the chin that can make the face appear older or heavier. This fullness can be caused by aging, genetics and/or weight gain and is often resistant to diet and exercise alone. KYBELLA® is a prescription medicine used in adults to improve the appearance and profile of moderate to severe fat below the chin (submental fat), also called, “double chin.” KYBELLA® is indicated for improvement in the appearance of moderate to severe convexity or fullness associated with submental fat in adults. You and your doctor will design a treatment plan tailored to help you improve your chin profile. During your treatment sessions, your HCP will administer KYBELLA® into the fat under your chin using multiple injections. Many patients experience visible results in 2 to 4 treatment sessions. Only you and your doctor can decide if KYBELLA® is right for you. If you’re bothered by submental fullness, or double chin, ask your doctor about KYBELLA®. Before receiving KYBELLA®, tell your healthcare provider about all of your medical conditions, including if you: have had or plan to have surgery on your face, neck, or chin; have had cosmetic treatments on your face, neck or chin; have had or have medical conditions in or near the neck area; have had or have trouble swallowing; have bleeding problems; are pregnant or plan to become pregnant (it is not known if KYBELLA® will harm your unborn baby); are breastfeeding or plan to breastfeed (it is not known if KYBELLA® passes into your breast milk; talk to your healthcare provider about the best way to feed your baby if you receive KYBELLA®).